Melt butter into a heavy pot. 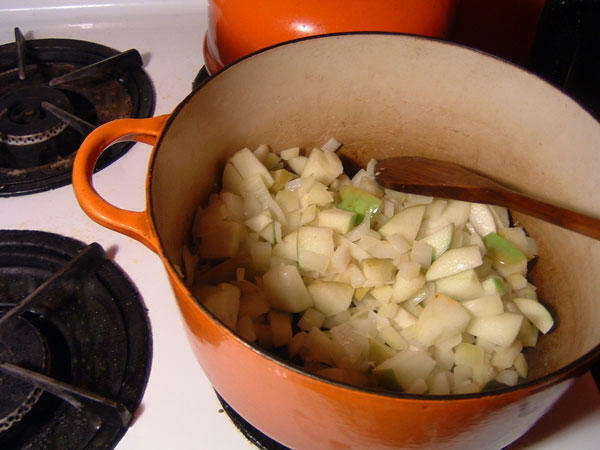 Add the cubed onion, garlic and apple to the pot and saute until translucent and soft. Add a dash of salt. 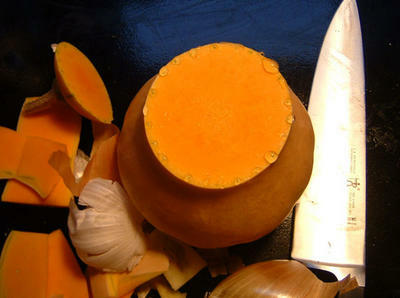 Add cubed squash to the pot and mix in all the spices. 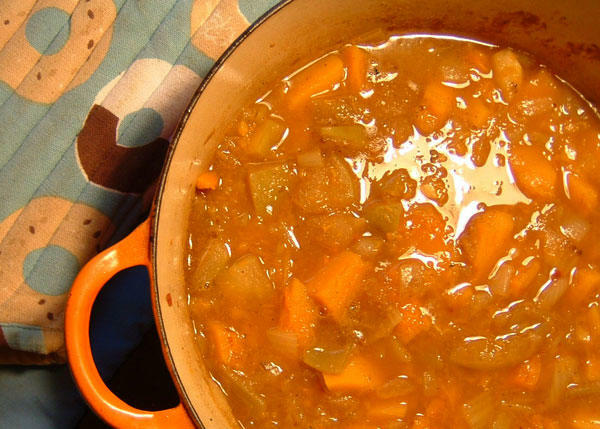 Cover the vegetables with water and let simmer until squash is soft and the mixture is fragrant, about 30 minutes. Taste and reseason if necessary. Puree and serve with a dollup of yogurt. 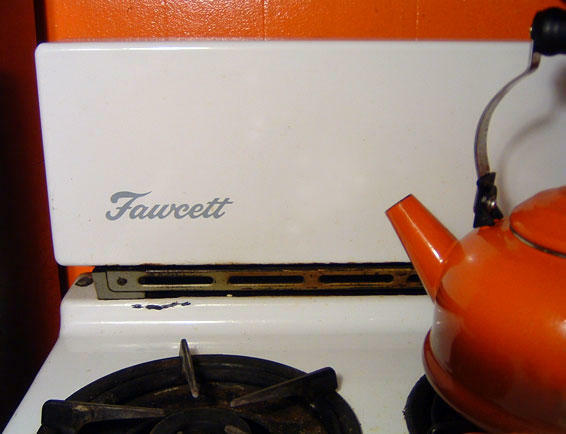 I cannot begin to express how cool your orange kitchen is, with your orange Le Creuset. The soup looks good, too, of course, but that orange! Cute! 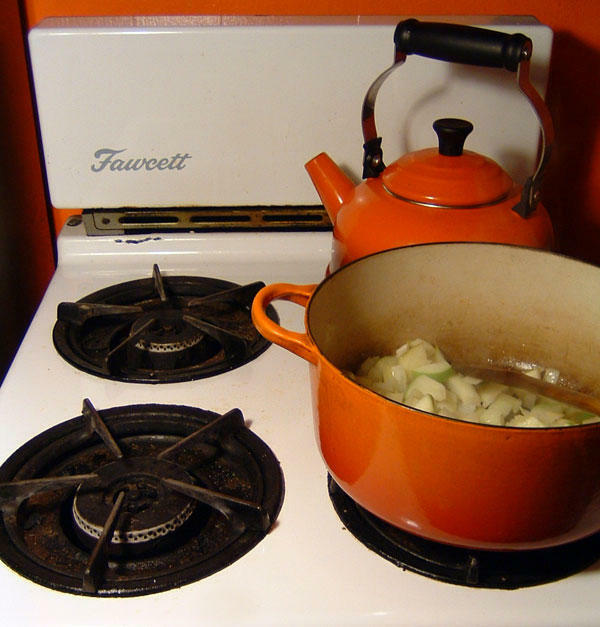 Thanks Crystal, I so love my orange kitchen too and figured my soup-making skillz would make a good photoshoot! Joe, the soup was awesome! So tasty, I wouldn’t change a thing. Yumyumyumyum. I have been searching for a delicious squash soup that is more than just pureed squash and broth but not requiring five spice pastes and 2000 calories of cream and butter….I think I have found a winner. Onve important question: What kind of curry paste do you recommend? Michele, I always used Patak’s curry pastes. I LURV this series of photos! Beautiful!